Written for a normal symphony orchestra complement with an expanded triple woodwind section (including piccolos, alto flute, oboe d’amore, English horn, E flat clarinet, bass clarinet, and double-bassoon), this work was commissioned by San Francisco Symphony Orchestra. The piece opens with a dense texture made up of many individual melodic lines. 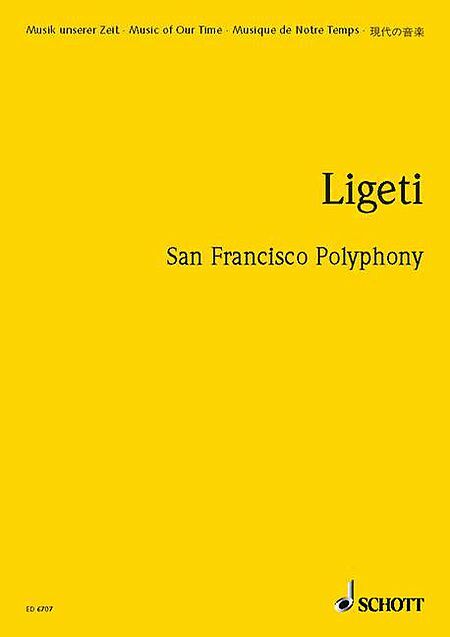 In contrast to the Ligeti‘s early pieces, which used the shimmering moving clusters of what Ligeti calls “micropolyphony,” this composition uses much wider spacing and aims for “drier, sharper, and more graphic … melodic lines” that are more “translucent.” The piece is characterized by the subtle technique of timbre modulation achieved through the constant reorchestration of dynamic material. At the beginning, certain melodies stand out from a group becuase they are played by several instruments in unison. The number of voices is very gradually reduced, producing an unusual ascending-pitch illusion which leaves only the higher woodwinds playing. The winds continue to float, cycling in the air until interrupted by a wide-ranging, very quiet dissonant string chord. Out of that sustained mass, melodies again begin to emerge, slowly at first and then in an onrushing cacophony of strings (here the winds hold a sustained tone). The rushing tempo is gradually slowed down to a cycling pattern, which is taken up by the winds as the strings return to a sustained chord. Heroic and passionate melodic gestures arise first in the unison horns and then in the strings, as the other instruments re-create the dense atmospheric bed heard at the beginning. All the players then begin different fixed cycling patterns. Once again the number of instruments playing is very gradually reduced, this time creating an illusion of depth change. A very mysterious timbre is left with very high strings, very low strings, and a high brittle piano trill. A shockingly loud bass drum shot occurs as the strings continue to hold. The percussion blast initates a high woodwind cluster (reminding one of Ligeti’s early orchestral work, Atmospheres). A second percussive shock comes from a gong which increases the intensity of the massed winds. Underscored by low string drones, the winds begin trills like the calls of extraterrestial birds. These trills are gradually modified into quickly running patterns for a solo violin, which are spread to the piano and xylophone, then to winds and back to the string section — a wonderful instance of the very subtle shifting of timbres which characterizes much of this work. A slowly unfolding horn melody appears within these patterns, the melody being transferred to various winds and brass. This whirlwind continues unabated (as if all the melodies in the world have become one giant wave pattern), changing its orchestration, ebbing slightly at points, and then after approximately three minutes intensifying toward a loud and sudden conclusion. Berliner Philharmoniker conducted by Jonathan Nott. 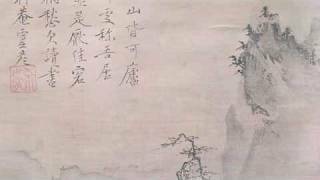 Stravinsky’s Three Japanese Lyrics (1912-1913) were composed just as the taste for all things Oriental, from fine arts to fashion, was reaching its apex throughout Europe. Nowhere was this fad more rampant than in Paris, where the composer lived and, in 1912, had come upon an anthology of Japanese poetry translated into Russian, providing him with the texts for a group of three songs. These terse and somewhat mournful songs — “Akahito,” “Mazatsumi,” and “Tsaraiuki” — represent the composer’s most overt adoption of Far Eastern subject matter. Like many of Stravinsky’s works which draw upon elements from “exotic” sources, the songs reveal a degree of detachment, objectivity and stylization. The Three Japanese Lyrics were composed some 15 to 18 months after Le sacre du printemps (1911-1913) was completed; as in that seminal ballet, the songs’ melodic material is based upon the repetition of numerous small cells. “Akahito” features a six-note ostinato comprised of slow, ornamented eighth notes that run throughout the song, while “Tsamaiuki” contains tiny refrain figures that are likewise repeated in an ostinato pattern. The Lyrics suggest a similarity to Le sacre du printemps in terms of subject matter as well. Both illustrate the dawning of spring, but while Le sacre du printemps expresses the death of winter through violence and elemental force, the Lyrics draw attention elsewhere. Here the emphasis is more upon the visual, decorative aspects of the season, symbolized by the color white — patterns of white flowers set against fresh snowfall. Texturally, the Lyrics reveal another significant influence: Schoenberg’s Pierrot Lunaire (1912). Stravinsky attended a performance of the revolutionary melodrama in Berlin in December 1912, and Schoenberg’s band of flute, clarinet, violin, cello, and piano was a likely inspiration for the instrumentation of the Lyrics (two flutes, two clarinets, and piano quintet). Moreover, the Lyrics, despite their clearly tonal language, employ harsh sonorities and free chromaticism to a greater extent than in Stravinsky’s previous works. Following their first performance in 1914, many listeners were taken by the Lyrics’ metrical freedom and ambiguity. Indeed, rather than relying upon stereotyped orientalist clichés like pentatonic scales and garish ornamentation, Stravinsky emulates Japanese speech patterns with a remarkable degree of authenticity. Evelyn Lear, soprano; Columbia Symphony, cond. Robert Craft. Art by Tensho Shubun. 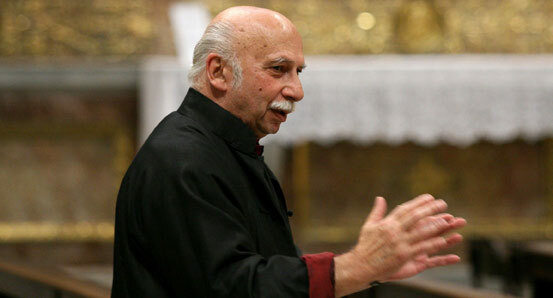 Giya Kancheli (Georgian: born 10 August 1935 in Tbilisi) is a Georgian composer resident in Belgium. Natalia Pschenitschnikova – Alto Flute.